Building community - Double Farley - Work in new ways. ​For us, business isn't just about dollars and the fiscal bottom line. Being involved in the growth of our Whanganui community, giving our time, expertise and perspective, where and when we can, is a vital part of our work. We provide pro-bono and discounted services to charities and our community on a regular basis. ​Being involved in our community and with a wide range of other people allows us to continue our own learning, to try things out with the support of others, and develop stronger relationships. All of this is not only important for our business, but for us as individuals. Confluence a social enterprise which operates as a coworking space and events venue in Whanganui. A great group of like-minded sole-traders, remote employees, and small businesses work together here: sharing ideas, working hard, and having fun. Below is a copy of Confluence.kiwi website. Confluence is where we host our community events. If it helps people work in new ways then we're keen to bring it to Whanganui and our community. Here's a selection of the events which we've helped bring to Whanganui over the last couple of years. Our skills in producing digital video and film material for education markets are frequently called upon. As a company we also value the art of storytelling to a general audience. Stories about our community, history, and hidden aspects of our young nation are important to capture and tell for future generations. So much in New Zealand remains unique to the rest of the world, although this is slowly changing. Previous generations captured New Zealand stories through news film reels which often broadened out into mini documentary features, but all were enjoyed by cinema audiences. Occasionally we are able to take the time needed to continue capturing those stories for cinema audiences to enjoy. ​Here are a few of the films we are working on or have produced and released recently. Are these all Kiwi now? This is the question we consider in a new feature length documentary that is being filmed throughout 2018. Birds of A Feather investigates the relationship between introduced birds in New Zealand, a land that was once ruled by birds before humans arrived. Including a historical review of the early human's arrivals and their relationships with birds of hunting and using their feathers in ornamental cloaks. Through to the 19th century European arrivals and their Acclimatisation Societies who sought everything from pest eradication to 'making it more like England.". The majority of the filming will be focused on the modern day relationships between people and birds. Capturing the common sight and huge flocks of once scarce, heavily protected, introduced birds such as starlings, sparrows, peacocks, turkeys, and pigeons. After generations of breeding and specialisation to New Zealand conditions, this film ultimately seeks answers from New Zealanders on what it really means to be considered a Kiwi, both from the feather and in a wider context, the human side. Just over 8 years ago we were honoured to capture some stories in the Katherine Mansfield Birthplace museum, Wellington. Over a couple of days filming, including one day devoted to interviews, we gathered wonderful shots of the house and garden. The main focus of our filming was to discover the stories of toys that had been brought to the museum. We interviewed their owners, adults and a few children, about why their dolls, Teddys, cars, books, and puppets, meant so much to them and how they are still their best loved. amazing , often poignant, and all previously untold stories about the small things treasured by un-aging hearts to the big screen. Working with director Juanita Deely, Double Farley produced this fascinating insight into the life of Robin Hyde as told by her son Derek. This short documentary was selected for the prestigious DocEdge 2018 festival and screened as part of their NZ showcase of films, including Q&A's afterwards with the director and star of the film, Derek. It has been selected to screen at the Auckland GoingWest festival in September, and will be screening at Confluence in Whanganui on the 20 September 2018. Kevin, his filmmaking team, and many people in this special Whanganui community spent hundreds of hours making the beautiful documentary Set In Stone. In 2017 Set in Stone was selected, and went onto win two awards in the prestigious DocEdge film festival. DocEdge screens the best international and homegrown documentaries. For more info check out docedge.nz. In that same year it was also officially selected for the Arohanui Film Festival, and had two very special home screenings in Whanganui. After a successful round of festival screenings, we are delighted to announce that a special director's cut of Set In Stone was completed in August 2018. This version, whilst essentially the same film, now has the original recorded narration replacing the onscreen captions and also features some recently release archive photographs of the Māori Contingent. You can be the first to see Set In Stone, the director's cut, as part of Confluence's upcoming documentary Thoughtful Thursdays screenings. It is scheduled for September 6th at 6:30pm. Tickets and more information can be found here. 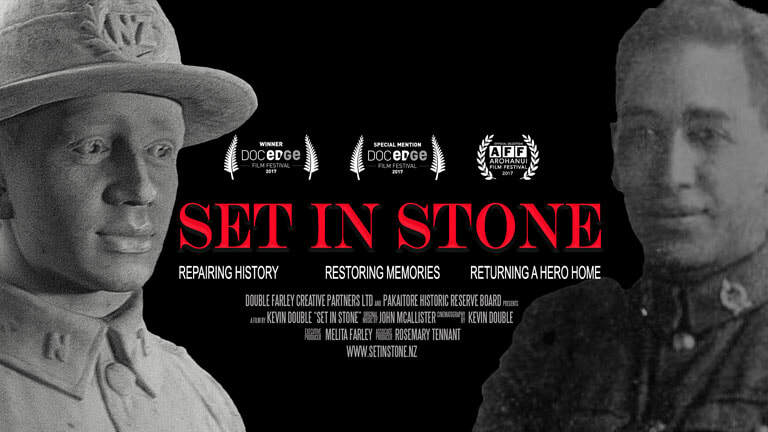 Find out more about the Set In Stone documentary film is also on its own site here.